via Channel 4 News report on e-cigs, featuring Peter Hajek and Ann McNeill. – YouTube. via Victorian doctor calls for end to contradictory laws over ‘life-saving’ e-cigarettes – 9news.com.au. Thank You For Vaping -The E Cigarette Debate – Documentaries – The New Yorker – YouTube. Top 5 Extraordinary E-Cigarette Facts – YouTube. via E-cigarettes – disruptive innovation & public health potential – YouTube. via Gerry Stimson discussing e-cigs on the BBC 19/08/15 – YouTube. When I made my ITV documentary “The Rise of the E-cigarette” for ITV Tonight in January last year, the devices were widely seen as far from mainstream. I was repeatedly told by experts (including the World Health Organisation) that we should take great care not to encourage their use because too little is known of their safety and effectiveness. Today, we got the closest we have ever seen to an official endorsement of e-cigarettes. Public Health England says they are 95 per cent safer than smoking normal cigarettes, and recommends that they be made available on NHS prescription for those wanting to quit tobacco, once they have been licensed as medicines. Today’s report puts health officials in the dock. Why are they so far behind the curve on this vital public health debate? This has been a revolution led by consumers – the 2.6 million-odd “vapers” who use -cigarettes. Innovation has been led by the (often small) firms who brought them to market with zero official support. Now, the spotlight must fall to the World Health Organisation, the NHS and the British Medical Association – will these authorities shift their stance? E-cigarettes are 95% less harmful than tobacco and could be prescribed on the NHS in future to help smokers quit, a review of their use has concluded. Experts who have compiled a report for Public Health England say “vaping” could be a “game changer” for persuading people to quit cigarettes. They also say there is no evidence they give children a “gateway” into smoking. Some health campaigners have welcomed the findings, but the British Medical Association has expressed caution. 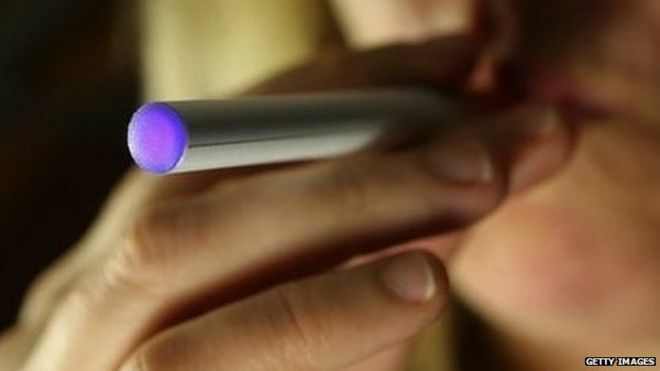 The Welsh government has previously announced that it plans to ban the use of e-cigarettes in enclosed spaces. E-cigarettes are increasingly popular and are now used by 2.6 million adults in Britain. But public health experts have been divided over whether they should be seen as a much safer alternative to smoking, or a pathway to a deadly addiction. Public Health England asked a team of experts to examine the emerging evidence. Their findings are unequivocal. On the question of safety, they conclude – as a broad estimate – that e-cigarettes are “around 95% less harmful” than smoking. One of the report authors, Prof Ann McNeill from King’s College London, said e-cigarettes could be a “game-changer” in public health. The report says that although GPs and stop-smoking services are currently not able to prescribe e-cigarettes as none of the products on the market are licensed for medicinal purposes, they hope that hurdle will be removed in the future. Public Health England says it is “committed to ensure that smokers have a range of evidence-based, effective tools to help them to quit. “We encourage smokers who want to use e-cigarettes as an aid to quit smoking to seek the support of local stop-smoking services, given the potential benefits as quitting aids,” it adds. In the meantime, Prof McNeill said she would urge health professionals to discuss the use of e-cigarettes with people who want to quit smoking. The review also highlights evidence that growing numbers of people have doubts over the safety of the devices. It says nearly half the population (44.8%) do not realise e-cigarettes are much less harmful than smoking. Prof Kevin Fenton, director of health and wellbeing at Public Health England, said it was important to tackle what he called “harmful myths”. The report concludes there is no evidence, so far, that e-cigarettes are acting as a route into smoking for children or non-smokers. It says regular use is found “almost exclusively” among those who have already smoked, and that e-cigarettes have rapidly become the most widely used quitting aid in England. The British Medical Association, which has backed curbs on the use of e-cigarettes, was more guarded. Spokesman Dr Ram Moorthy said the review would help ensure an informed debate, but he insisted the public needed protection. 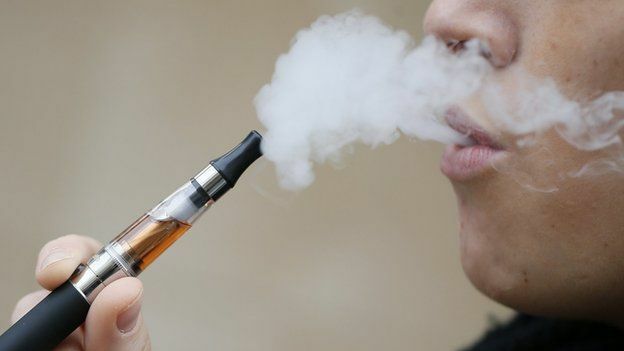 A Welsh Government spokesperson said: “We are concerned the use of e-cigarettes may renormalise smoking, especially for a generation who have grown up in a largely smoke-free society. via E-cigarettes could be prescribed by the NHS to help smokers quit, report says – BBC News.